According to the Eversource Outage map, 76 customers in Bethel are presently without power, which is .87% of 8,734 customers served. 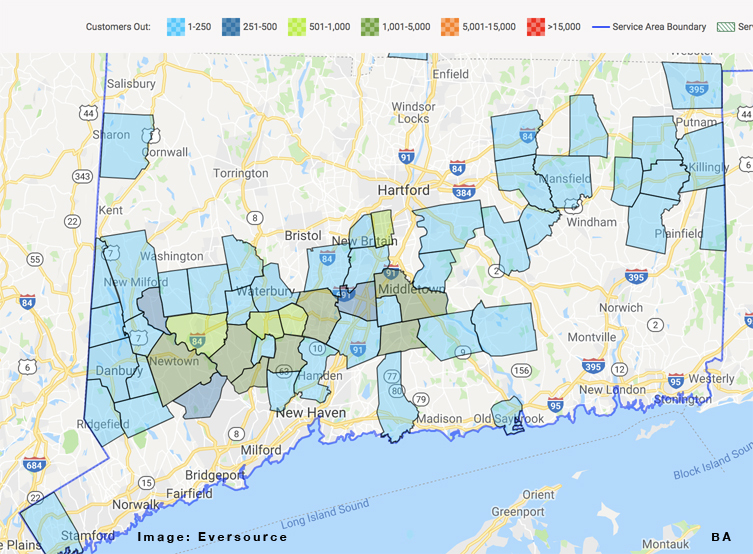 For a complete list of outages by town in Connecticut, view map above and also click HERE. Ice is building up on tree 🌲 branches across the state. Heavy branches could snap and cause issues with the power lines. If you see a downed line, ALWAYS assume it’s live, stay away, and call 9-1–1 immediately. Report your outage by calling📱 us at 800-286-2000. With a powerful storm bringing snow, ice, sleet and freezing rain to Connecticut – followed by frigid temperatures – Eversource is ready to address any storm-related power outages or damage to the electric system. Remember – always stay clear of downed wires and to report them immediately to 9-1-1. Make sure to visit our Storm Preparedness section for more information on important considerations for staying safe during and after a storm. Be sure to report any outage online or by calling 800-286-2000. If you signed up for two-way texting you can send a text to report an outage and receive outage updates as they happen.